The shop at the corner of Montpelier Road and Claude Street. 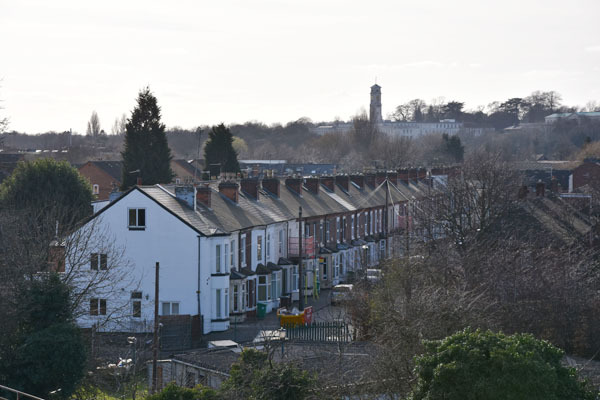 In the distance are some of the Beeston Road properties. 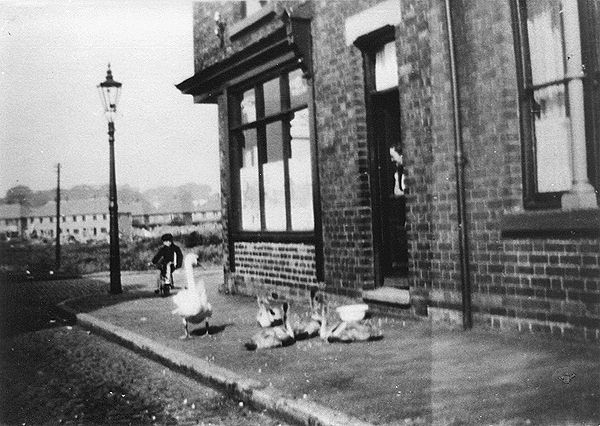 Whether the wildlife shown in this photograph were regular visitors to this part of Dunkirk is not known. 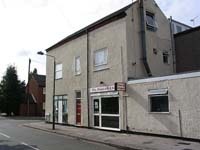 It may take some believing but this is what the property in the previous photograph looks like today (July 2005). It has been converted into two separate businesses with the Dunkirk Chippy housed in the portion on the right. When the photograph was taken the premises on the left were unoccupied. 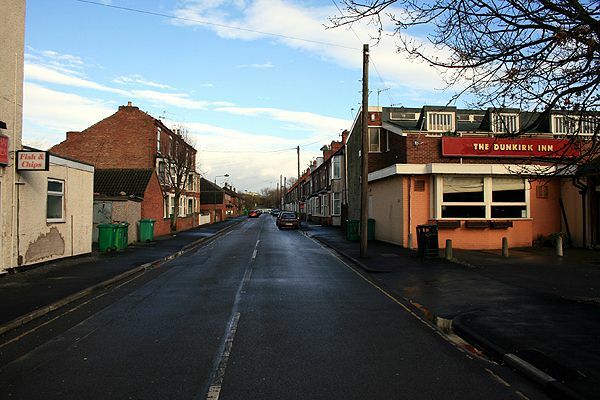 A 2008 view looking along Claude Street from its junction with Montpelier Road. The junction of Claude Street and Bunting Street - photograph taken in 2016. 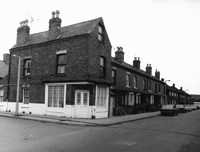 The junction of Claude Street and Bunting Street as it looked in 1976 when Reg Baker took this photograph. The properties in the foreground were all demolished and replaced in the early 1980s by the houses shown in the previous photograph. 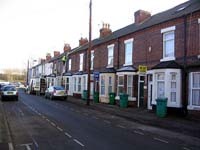 Click here to see the original image which is taken from the Picture the Past website. 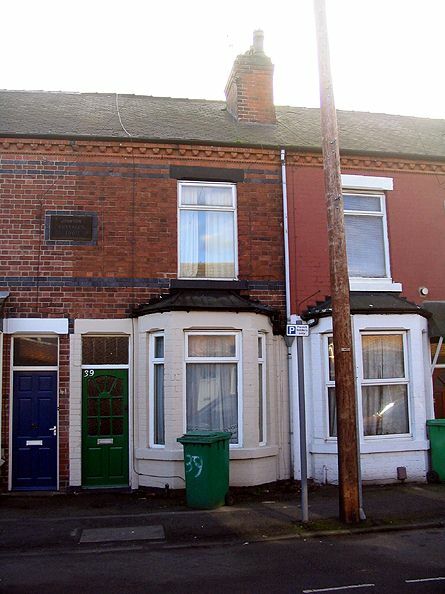 Ken Beckhaus who lives in Australia got in touch with us asking if we had a photo showing No.39 Claude Street. At the time we didn't so we took this one in January 2007. 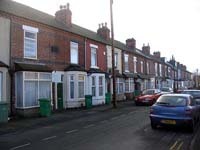 A more general view of Claude Street in 2007 including No.39. This particular property was where Ken's mother, Gwen Beckhaus (née Atkinson), was born in 1951. Another view taking in No.39 but looking the other way along Claude Street. The Atkinson family lived at No.39 until 1964. 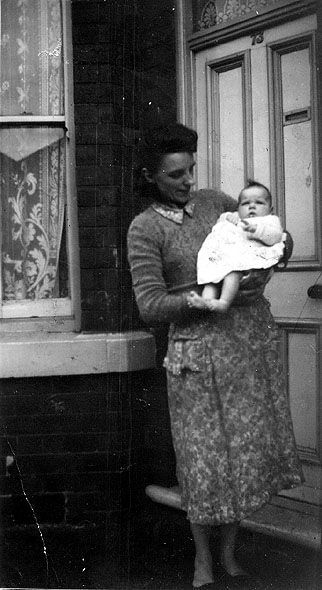 Joan Ellis standing outside No.71 Claude Street in 1958 with her baby daughter, Angela, in her arms. 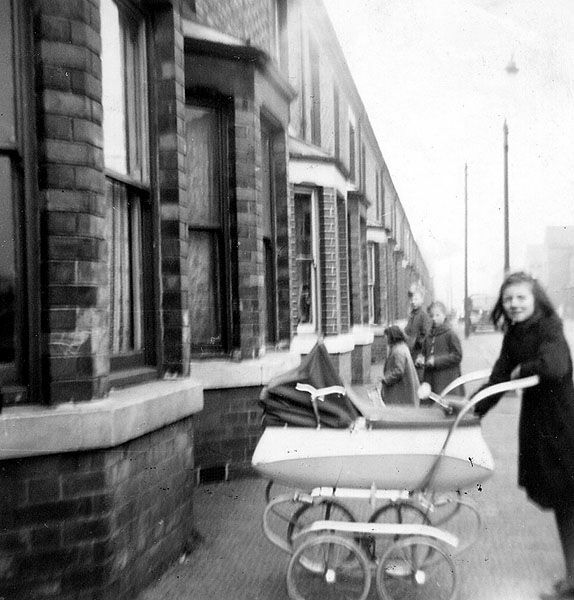 Looking along Claude Street in 1961/2 with Pat Ellis and pram in the foreground. 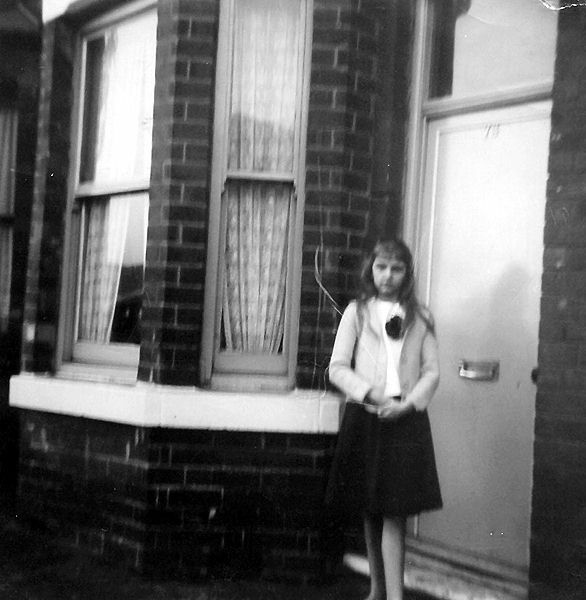 Maureen Ellis standing outside No.71 Claude Street c. 1962. 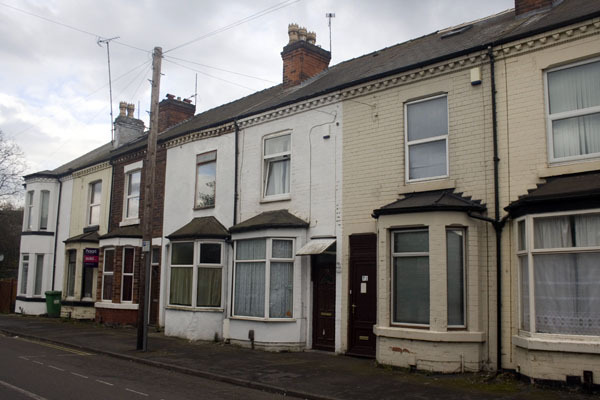 In Lenton Times No.35 we feature an article about Frederick Mitchell who used to live at No.73 Claude Street. This photograph showing No.73 in the centre of the picture was taken to accompany the article. A more general shot of Claude Street taking in both Nos. 73 and 71. The article on Frederick Mitchell focused on the period after the Second World War when he had retired and decided to build an extremely large rowing boat in the shed in his back yard. A 2016 view of the bottom end of Claude Street as seen from Clifton Boulevard. I lived with my family at 71 Claude Street Dunkirk from 1956 to 1963. We are the Ellis family, consisting of Ted (dad), Joan (mam), Maureen, Pat, Angela and Debi. 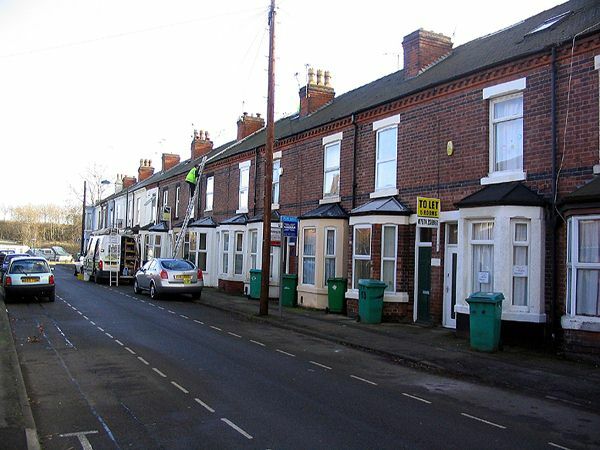 After Claude Street we moved to West Bridgford where we lived for three years and then in 1966 the whole family emigrate to Australia and since 1966 I have lived in Sydney. My sisters and I came back to England for a visit in 2005 - the first time I had been back in almost forty years. 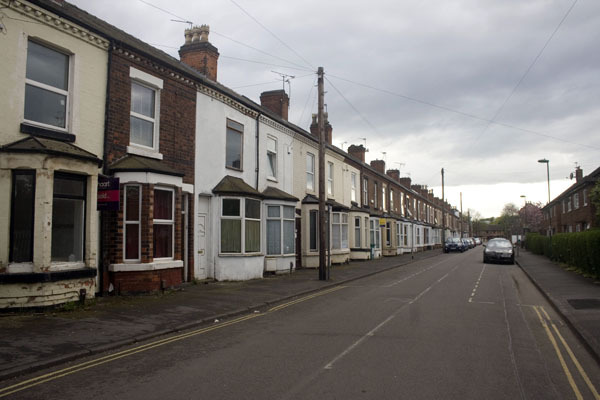 The memories came flooding back and made me realise how much I had enjoyed my childhood in Nottingham. The bonfire nights on 'The Common', the annual Goose Fair, the brownies and the coach trips from the Dunkirk Hotel to the seaside, organised by some good hearted souls who knew we wouldn't otherwise be able to afford a holiday. 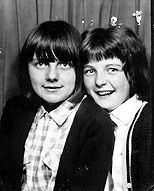 We would play rounders and other such games in the street right into the evening and if dad had won on the horses we would get fish and chips from the very same chip shop shown in the photographs above. I can recall practically every household name from one end of Claude Street to the other.